Below method of NITRO On-Premises installation is now deprecated. For latest installation instructions, please refer this article. This article describes the steps to install the Crow Canyon NITRO solutions for SharePoint On-Premises. SharePoint should be installed and configured (SharePoint 2013/2016) and server should be in stable state. Go to Central Admin –> System Settings –> Manage Servers in the farm, all the SharePoint servers in the farm should be at “No Action Required” or “Upgrade Available” state. Logged in user should be a domain user, local admin and a member of Farm Administrators group in SharePoint. Logged in user should have owner rights on SharePoint Admin content database, SharePoint configuration database and target web application’s content database. SharePoint Timer Service and SharePoint Administration services should be in running state. 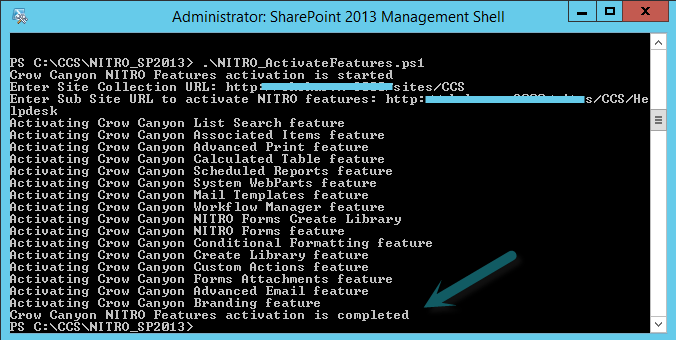 Extract the files from *.zip file and it contains list of Crow Canyon solutions (*.wsp) along with two PowerShell scripts (NITRO_Install.ps1, NITRO_ActivateFeatures.ps1) to be copied to the SharePoint server. In case if there are multiple servers exists in the SharePoint farm, we can copy the solutions to one of the servers that has “Microsoft SharePoint Foundation Web Application” service running. Enter “.\NITRO_Install.ps1” and hit enter to start solutions installation. It prompts for the web application URL to deploy the solutions. Please provide the Web application URL and hit enter. This will add and deploy all the Crow Canyon solutions (*.wsp) in the SharePoint Server. Open SharePoint Central Administration –> System Settings –> Farm Management –> Manage farm solutions and please wait until all the solutions status changes to “Deployed”. NITRO Forms, NITRO Custom Actions, Advanced Email, conditional formatting and branding features are web site (sub site) scoped features. Crow Canyon Workflow Manager, List search, Advanced Print, Calculated table, Crow Canyon web parts are site collection scoped features. So, the activate script prompts for both site collection and sub site URL.Provide the target site collection and hit enter (Sample screenshot below). It prompts for the web URL (sub site) for which the site level features need to be activated. Provide the site URL and hit enter (Sample screenshot below). If we would like to configure portal for a site, please create a new sub site under this site, and then activate below sub site scoped features to the newly created portal sub site. Open Central Administration –> site settings –> Manage site features –> activate “Crow Canyon License Manager”. This creates a new link “Crow Canyon License Manager“ in “System Settings” in Central Administration site. Open this new “Crow Canyon License Manager” page, and send “Farm ID” to sharepointsupport@crowanyon.com. We will generate the trial licenses and will send you. Once the trial licenses are received, go to “Crow Canyon License Manager” page in Central Administration, –> click on “Register” for the below components and insert the corresponding license keys. Portal is a special case, here we need to register license for every portal instance. Please contact Crow Canyon (sharepointsupport@crowanyon.com) and send the new portal site URL for the license. It is mandatory to verify the license key status in all the SharePoint servers in the farm after registering the license keys. Run the “CrowCanyon.RegisterLicenseKey.exe” tool as administrator, select the solution name in the “Product Name” drop down and click “Check License Status”. Repeat this in all the SharePoint servers in the farm. Please contact sharepointsupport@crowcanyon.com in case of any queries regarding the installation process.